The technique of tapping on the electric bass is still in its infancy. Two-Handed Tapping is a monumental contribution to the pedagogy of this style. All of the music contained in this book was written for the tapping bassist. This means that the music fits on the four-string electric bass and was tapped before notated. As the notated music can be quite difficult to read, the video recordings of each song will make the process of learning clear and concise. Just copy the fingers and motions. Each song focuses on a specific technical challenge found in the tapping style. 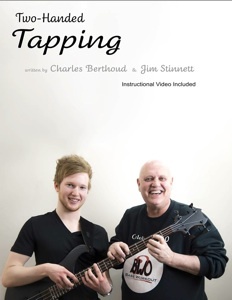 By learning just one of the songs in this book your tapping chops will improve immensely. Any of the songs can serve as an excellent lesson and result in a beautiful solo piece for you to perform.